Ich denke, es war mehr ein nach Hause kommen, als wäre es Karma. Nach einigen Jahren des Reisens habe ich mich entschlossen, hier zu bleiben, und ich hatte immer das Gefühl, hier sehr willkommen zu sein! In meinem Land eckte ich öfter an. Zum Beispiel habe ich nicht die Art von Beruf, die von der Gesellschaft akzeptiert wird, (wie z. B. Rechtsanwalt, Arzt, Ingenieur usw.). Mein Land ist ein Land, das einen Kult um den perfekten Körper macht, es gibt viele Machos, ein Land, das zunehmend von Menschen regiert wird, die ihre eigene Religion voran treiben um Gesetze zu rechtfertigen, die jedoch mehr und mehr die Rechte der Bevölkerung einschränken, an der Grenze zur Korruption. Frauen müssen sehr feminin sein, um anerkannt zu werden, von ihren Freunden, Männern, Familien und am Arbeitsplatz. Stellen Sie sich mich vor, eine tätowierte Frau, Tätowiererin, androgen, lesbisch, kurze Haare – das passt auf jeden Fall überhaupt nicht zusammen. Ich passe nicht in ein Land, wo es grundsätzlich akzeptiert wird, dass sich ein Hetero-Mann während des Karnevals wie eine Frau kleidet um Spaß zu haben. Dieselben Menschen jedoch das restliche Jahr über, lesbische und transsexuelle Frauen angreifen und beleidigen. In meinem Land wird alle 28 Stunden ein Mensch der Lesben-, Homosexuellen-, Bisexuellen- und Transgender-Community ermordet. Hier in Deutschland fühle ich mich frei, zu sein wer ich bin und zu lieben wen ich will, ohne aus irgendwelchen Gründen diskriminiert zu werden. „I consider myself a pilgrim. Most of my trips have had spiritual purposes. Being a tattoo artist has made my traveling life much easier. 11 years ago I dropped my life in Brazil , my studio, my home, my relationship, my friends and went out to conquer the world. One of the first places I went to was Germany and I fell in love at first sight ... I think it was more like coming home, a karmic impression. After a few years of traveling I decided to stay here and I always felt very welcome here! In my country I do not fit in in many ways. For example I do not have the kind of profession, which is accepted by society (lawyer, doctor, engineer etc.). My country is a country that has a cult of the perfect body, a race of machos, a country that is increasingly governed by people pushing their own religion to justify laws that take away more and more rights of the public, bordering on corruption. Women need to be extremely feminine to be approved by their boyfriends, husbands, families and their workplace. 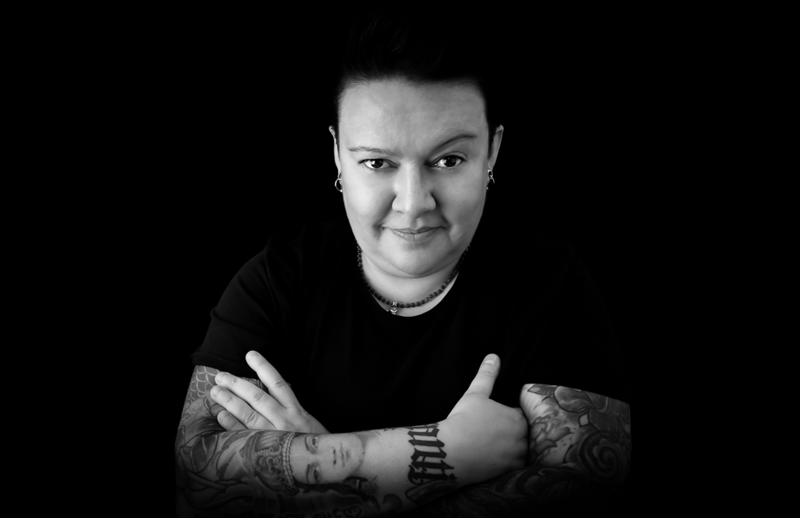 Imagine me, a tattooed woman, tattoo artist, androgen, lesbian, short hair – that is definitely a bad match. I don’t fit into a country, where it is generally accceptable during carneval for a hetero man to have fun by dressing up like a woman, but the rest of the year, the same people assaultor insult gays and transsexual women. In my country, every 28 hours a person of the lesbian, gay, bisexual and transgender community is murdered. Here I feel free to be who I am and to love who I want to, without being discriminated for any reason." „me considero uma peregrina. a maioria das minhas viagens tem e teve um proposito espiritual. por ser tatuadora isso facilitou muito minha vida de viajante. 11 anos atras larguei minha vida no Brasil... studio-casa-relacionamento-amigos e ganhei o mundo. um dos primeiros lugares que eu conheci foi a Alemanha e me apaixonei a primeira vista... acho que foi mais um reencontro, uma impressão karmica. depois de alguns anos viajando resolvi ficar aqui. sempre me senti muito bem vinda aqui! no meu país não me encaixo em muitas coisas... por exemplo não ter uma profissao de destaque e aceitavel pela sociedade(advogado, medico, engenheiro etc) um pais que tem um culto ao corpo perfeito, povo machista, país que cada vez mais gorvernado por pessoas que empurram sua propria religião para justificar as leis que tiram cada vez mais os direitos do publico lgbt, alem da corrupção. mulheres que precisam ser extremamente femininas para serem aprovadas, pelo namorado, marido, familia, trabalho. imagine,eu, uma mulher tatuada, tatuadora, androgena, lesbica, gordinha de cabelo curto. definitivamente nao me encaixo.